Today, when the words, “ABS-CBN Star Magic”, are heard, an electric feeling of excitement and energy shoots up quickly among multitudes of fans around the world. And with very good reason. What began in 1992 as the ABS-CBN Talent Center – a stable of new stars in training and development for ABS-CBN – has grown to be the leading source of global Filipino pride with the rise of its world-class TV and film actors and actresses, recording artists, concert and stage performers, and commercial talents whose collective body of work has entertained several generations of Filipinos in the past 25 years. On the occasion of its Silver Anniversary, ABS-CBN Star Magic is poised to deliver its biggest and brightest year ever in its history. After its star-studded kick-off on the longest running Filipino weekly variety show, “ASAP”, last February, #StarMagic25 is raring to go around the world – in cooperation with ABS-CBN The Filipino Channel (TFC) -- to thrill millions of its fans abroad as a way of thanking them for their enthusiastic support for a quarter of a century. The North America leg of #StarMagic25 happens right in the beginning of the second quarter in the Year of the Rooster. 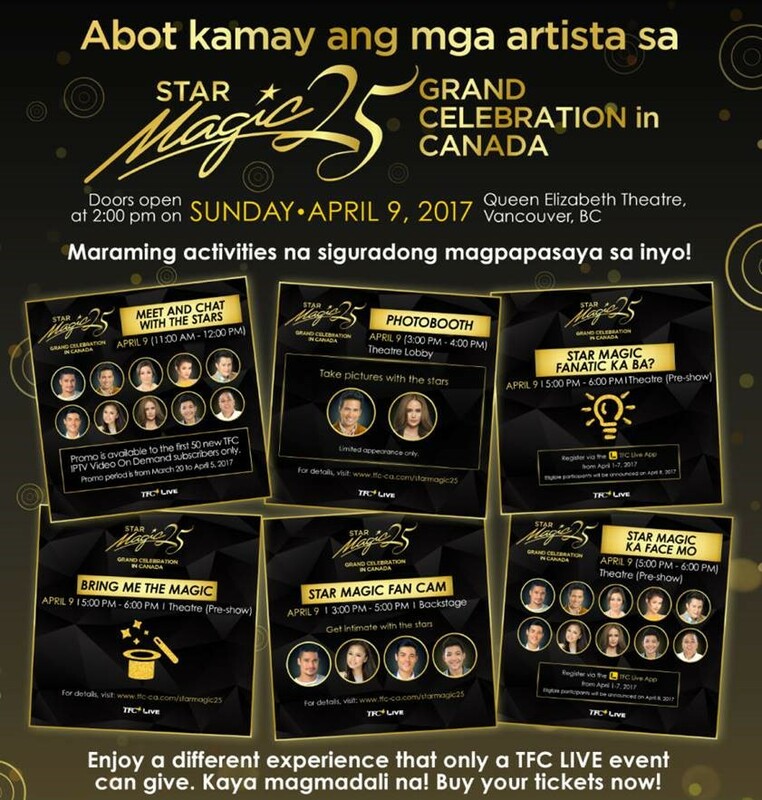 Starting in Canada, come this Sunday, April 9, Sunday, in Queen Elizabeth Theatre in Vancouver, 10 of the biggest and brightest Filipino celebrities will bring magic for the entire family with topnotch entertainment. TFC in Canada also marks its 10th anniversary with this celebration. In fact, this is just the kick-off to TFC Canada’s biggest year of events as the country observes its 150th anniversary. Piolo Pascual, Sam Milby, Jodi Sta. Maria, Kim Chiu, Xian Lim, Enrique Gil, Liza Soberano, Arci Munoz, Darren Espanto and Eric Nicolas will provide a wide breadth of entertainment with this diverse powerhouse cast. Doors open to the public at 2:00pm. Everyone is encouraged to download and use the TFC Live app for a more complete and engaging event experience right to the minute. Fun activities include: Fancam at the lobby so they will see the backstage action with stars interacting with them via live cam, photo booths of top TFC shows, “Ang Probinsiyano”, “A Love to Last” and “My Dear Heart”, and some surprise celebrity appearances. 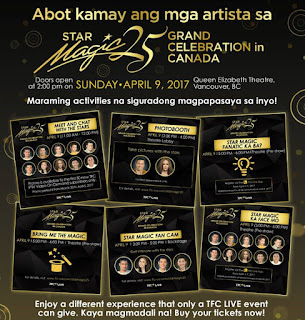 During the pre-show on-stage, there are “Star Magic Fanatic Ka Ba?” which is a trivia contest about Star Magic open to all ticket holders, and “Bring Me The Magic”, a “bring me” game. 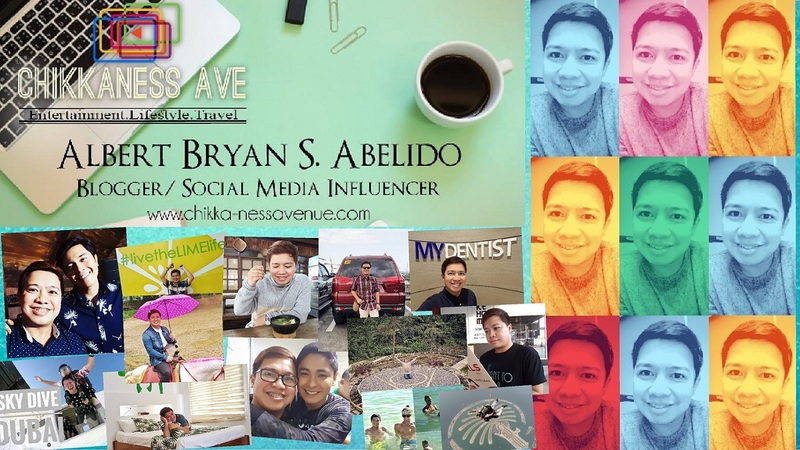 Both activities are hosted by Eric Nicolas. The cast grows bigger as it flies to familiar territory – California’s Great America, the site of many memorable and historic TFC events – for another activity-packed day on April 15. Here, the 10 stars will be joined by Janella Salvador, Robi Domingo and Rayver Cruz! The day starts with the Star Magic 25 Fam Run at 8:00am which invites all ticket holders to join a 3k morning jog with Jodi, Liza, Enrique, Arci, Janella and Eric! The first 25 finishers will get a very special treat: a photo op session with Piolo! At 10:00am, subscribe to TFC-IPTV at the TFC Pavilion and you’ll get the chance to be part of Picture With The Stars (Great America Pavilion Area). The first 50 Kapamilyas who subscribe to TFC’s IPTV Video on Demand automatically get this special treat with Kim, Xian, Liza and Enrique! Also at 10:00am is Bring Home the Magic at TFC Pavilion (Great America Pavilion Area). Exclusive souvenirs like Star Magic 25 t-shirts and retail merchandise of fan-favorite teleserye shows from the TFC Experience Store will be made available. There is also a Photo Booth of top TFC shows, “Ang Probinsiyano”, “A Love to Last”, and “My Dear Heart” starting at 10:00am also at the TFC Pavilion. 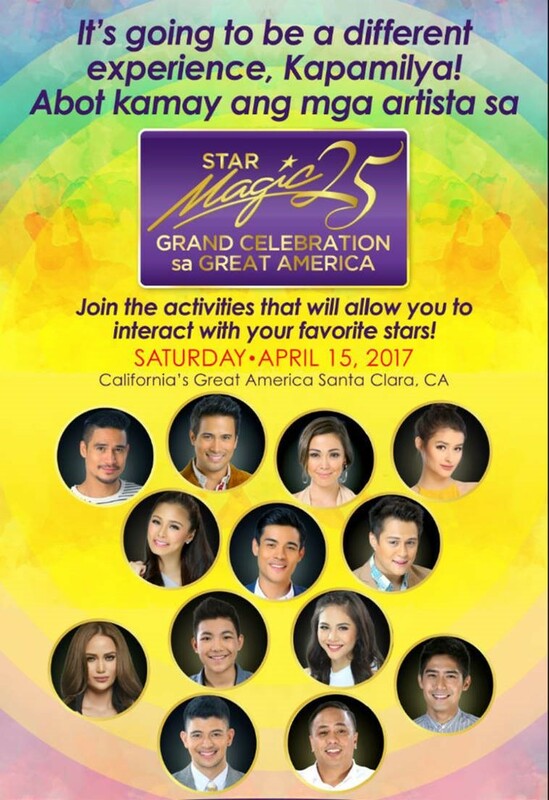 Watch for the celebrity appearances of Sam, Janella and Robi from 12:30pm-1:00pm at the Star Magic Photo Booth (Great America Pavilion Area). From 10:30am-5:00pm, there is the Sinemarathon at the Great America Theater. Your ticket entitles you not only to all activities, the main show and the rides, but also a day-long chill time at the movies! 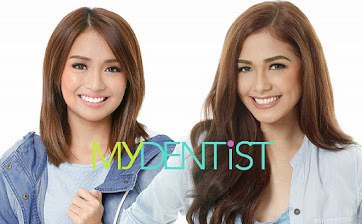 Enjoy movies like “My Exs and Whys”, “Starting Over Again” and “Bride For Rent”. Watch for a surprise celebrity appearance during the Sinemarathon! At 11:00am, there is Dance na Dance at the Great America Pavilion with 20 dancers getting the chance to dance and shoot a music video with Arci and Rayver! Three activities start at noon: there is Chat and Play, fun games with Kim Chiu, Robi Domingo and Eric Nicolas! There is also The Good Hour at noon at the Peanuts Playhouse, which is story-telling by Jodi,serenading by Darren and singing with Bantay Bata Voice, a children’s choir local to the Bay Area. 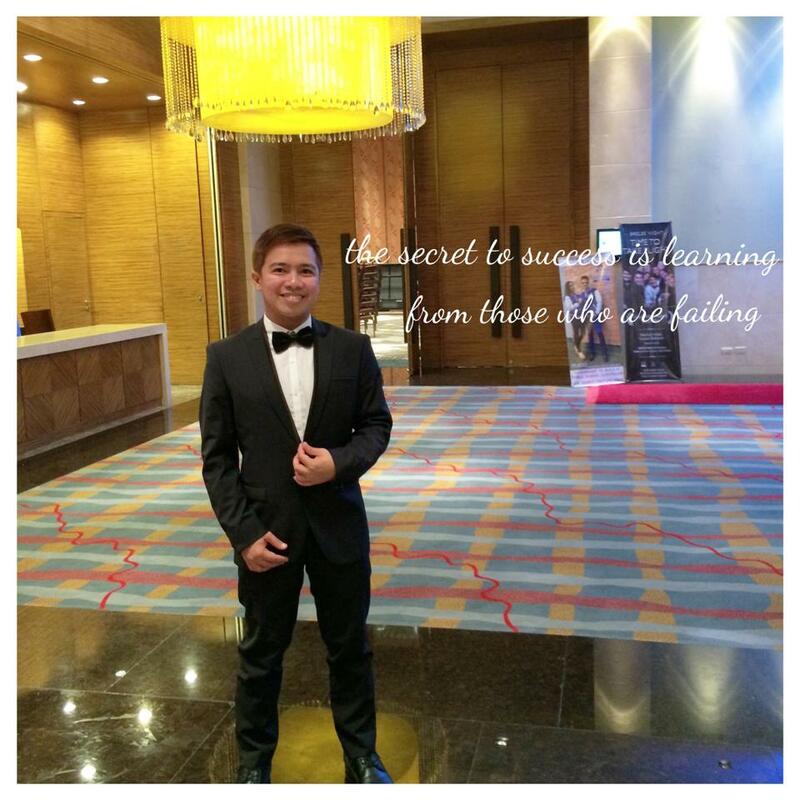 This is brought to fans by ABS-CBN Foundation International. And the third is Star Magic Hoops at the California’s Great America Half-Court Area for somebasketball challenge with Xian and Rayver! 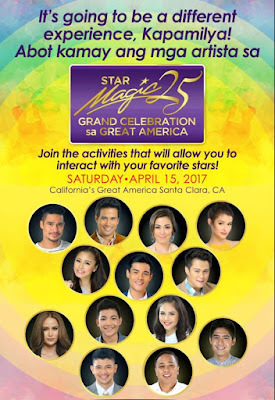 Then at 1:00pm, there is Star Magic Sing at the Great America Pavilion– an open mic with Sam and Darren! Main show starts at 5:00pm at the Redwood Amphitheater.